Neon, neon, neon!!!! I'm obsessed with neons!!! When I first saw the China Glaze Summer Neon Collection, I was unsure if I would purchase any. I have a Sinful Colors neon which I loved, but it was a jelly and took about 4 coats to get full coverage. When I saw the neons again released this season from Sinful Colors, I debated on purchasing them, but decided against it since they were flat cremes, and personally I'm not a huge fan of cremes. Shimmers are my friend. After seeing some swatches of China Glaze and the shimmer these neons had, I needed to find them and purchase them! So happy I did because I'm hooked and by far they are my favorite polishes! Originally, I only purchased three polishes from the collection, Hang Ten Toes, Splish Splash, and Sun Kissed. Days passed, and after much consideration (okay maybe not much) I went back to the store and purchased I'm With the Lifeguard. After these purchases plus a top coat, I may I need to go on a no-buy again. I ran home and immediately put Hang Ten Toes on my toes for by far one of the best pedicures I've ever had. For my nails, I put on Sun Kissed, the obnoxious highlighter yellow polish. I could not stop staring at my nails! 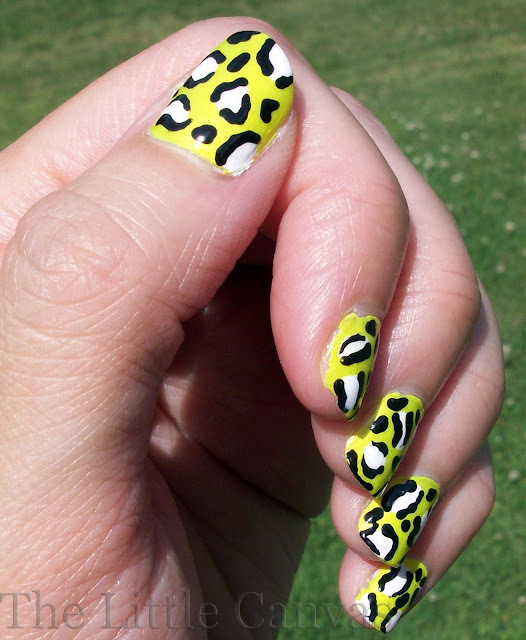 After two days of continuous typing thanks to a final paper, the tips were becoming a bit worn, so instead of touching them up, I decided it was time for some nail art....and what better than neon leopard nails? 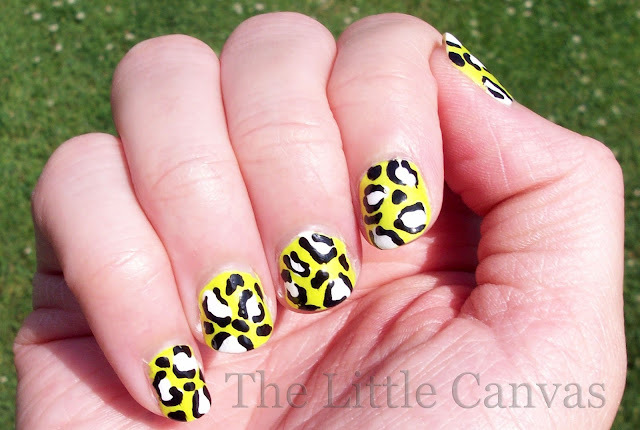 I'm in love with leopard nails, and in fact did a guest post featuring leopard spots over on Ryan's blog Dream a Little Dream of Polish. I figured why not do a design I was in love with on a color I am in love with. Can you see my injured nail?! It's grown out so well!!!! And for my right hand! I think I'm getting better at photographing it!! Goodness gracious, how I loved this manicure!!!! I wish my camera accurately capture the amazingness of this polish! The black kind of muted it, but still, it was so bright!!! For those of you who haven't tried leopard print and really want to, it's easy! With a dotting tool, I dotted on some uneven white dots. With a tooth pick, I stippled on the uneven lines around the white, and then filled in some of the blank spots with some more black. These are my first ever China Glaze polishes, and I will be going back and purchasing more! The application was amazing! I had read a couple reviews that the polishes were goopy and hard to apply, but I didn't have a single problem! Sun Kissed had full coverage with two coats and with some Out the Door top coat, the matte finish it dried with went to shiny. Same with for Hang Ten Toes. I do not have a single complaint about the polish and just am in love...can you tell??? To me, the shimmer makes this polish that much better. If you're looking for a neon, go out and hunt these down, you will NOT be sorry. Do you have any of the Summer Neons? Are you hooked? What's your favorite? 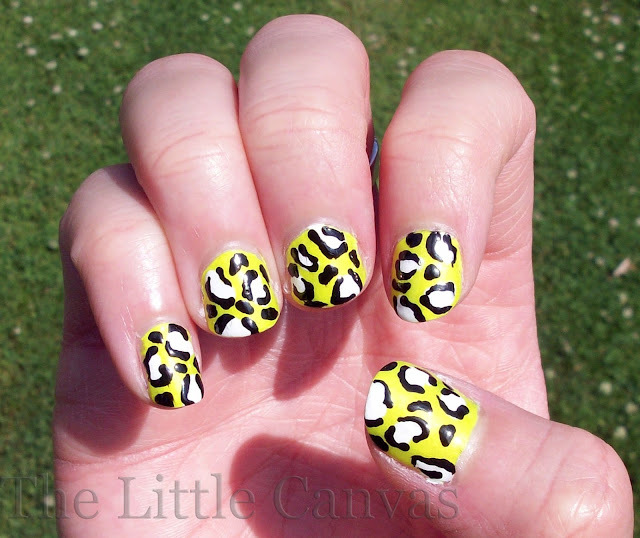 Are you one for animal print manicures?? 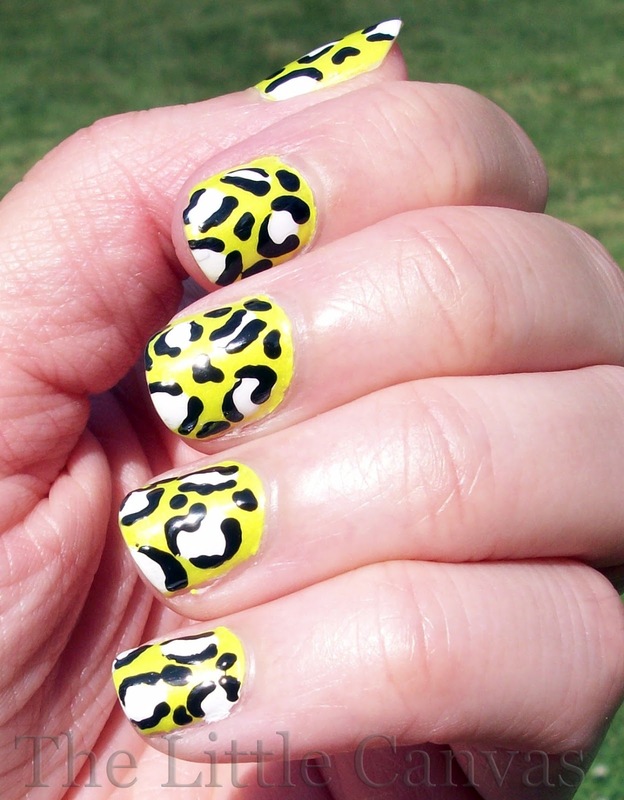 Stay tuned for some more neon-rifiic manicures. 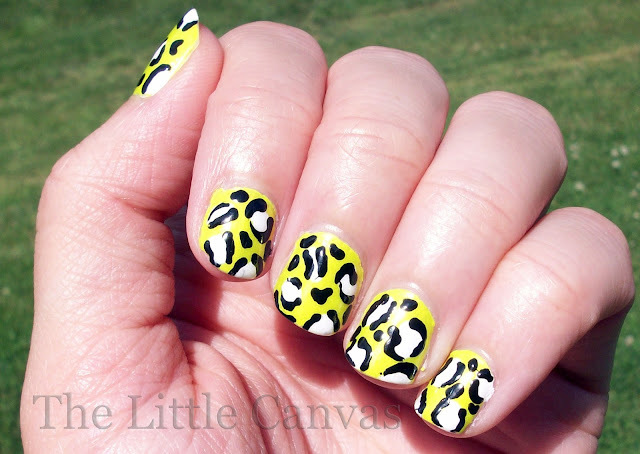 I LOVE these nails!!! Love them. 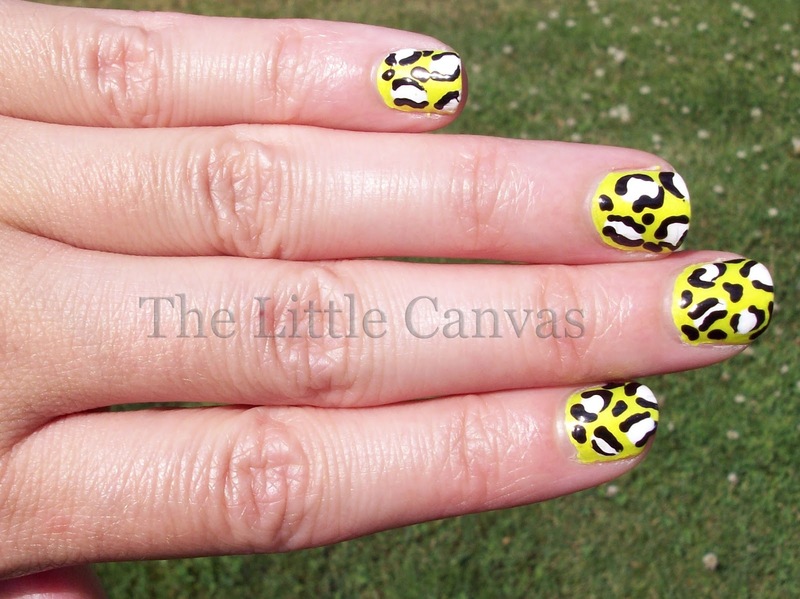 Besides the gnomes I have to tell you, these are my favorite nails ever! 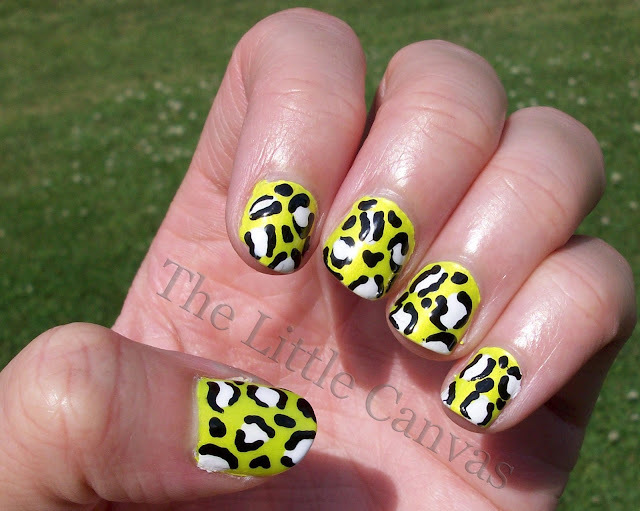 The color combo is spot on, the spots are spot on... Love it. That's all there is to say! Good job!! <3 thank you!!! glad you like them!!!! same here! i was sad when they chipped. Okay, the chip was a tiny segment, but i get antsy with the same mani on for days. They look GREAT!!! I love the color combo you used and I hope you try it again with more colors!!! Just FABULOUS!!!! just wait! 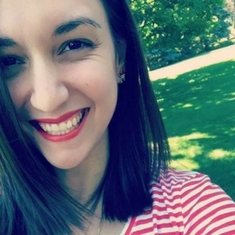 plus you should check out my guest post I did for Ryan tagged in this post! I did white nails with neon spots!!!! So cool! I've never freehanded a leopard or cheetah print...in fact, I had never done them until recently because I thought they were way out of my comfort zone! I ended up loving the animal print stamp over ChG Surfin' for Boys, which is my favorite polish of the year so far! you should try freehanding!!! it's def not as bad as it seems! i've never used a stamp so idk how difficult or easy they are.